Bicicletta is from the Italian Summer collection from last year and is a very light pink with tons of silver and purple shimmer. It's so soft and delicate and I love it! I do wish it were a bit more opaque, but the consistency was perfect (like all Rescue Beauty Lounge polishes)! Now this isn't a color I expected from Rescue Beauty, and I'm happy Ji stepped out of her comfort zone. 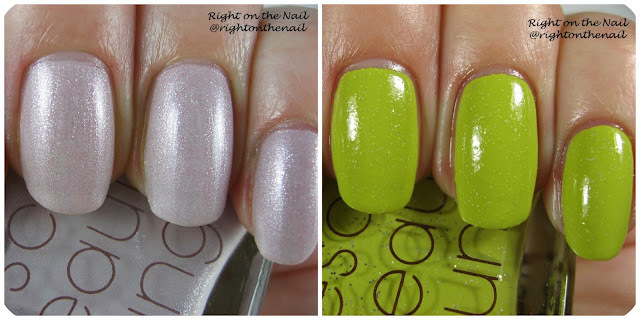 Cue the Montage is from the Anatomy of a #KDrama and is a bright chartreuse color with silver glitter. It's a really fun color, but I wish the silver in the glitter stood out a little more (maybe making the formula a little more jelly-like would have helped). The application and consistency were great in 2 coats, but you will need a really thick layer of topcoat (or 2) to get this one to stop being so bumpy. These retail for $20 (!! ), so I tried to only buy during sales. I am super sad they are closing down.You can get the last polishes on their website.